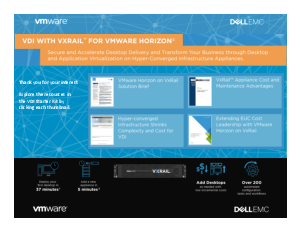 How can desktop and application virtualization with VxRail hyper-converged infrastructure (HCI) for VMware Horizon transform your business? VxRail with Horizon delivers a turnkey solution enabling organizations to cost-effectively and quickly transform physical desktops into secure digital workspaces. Best-in-class desktop density and unrivalled performance drives an exceptional user experience. Everything you need to easily deploy and scale the stateless desktop. Download the VDI Starter Kit now to learn more.